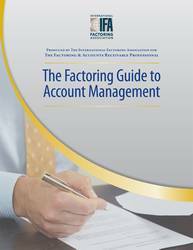 The Factoring Guide to Account Management is a practical guide detailing the best practices in the factoring industry for Account Executives. It outlines the roles and responsibilities of an Account Executive and offers a comprehensive framework of suggested guidelines. The guide shows different elements that can be used to gain a clearer understanding of the Factoring process and the role the Account Executive plays within that relationship. $100 discount for IFA members. $795 non-members, $695 members. Please login to your account to receive the discount. Copyright Â© 2018. All rights reserved. No part of this presentation may be reproduced, stored in a retrieval system, or transmitted in any form by any means, electronic, mechanical, photocopying, recording or otherwise without the written permission of the International Factoring Association.